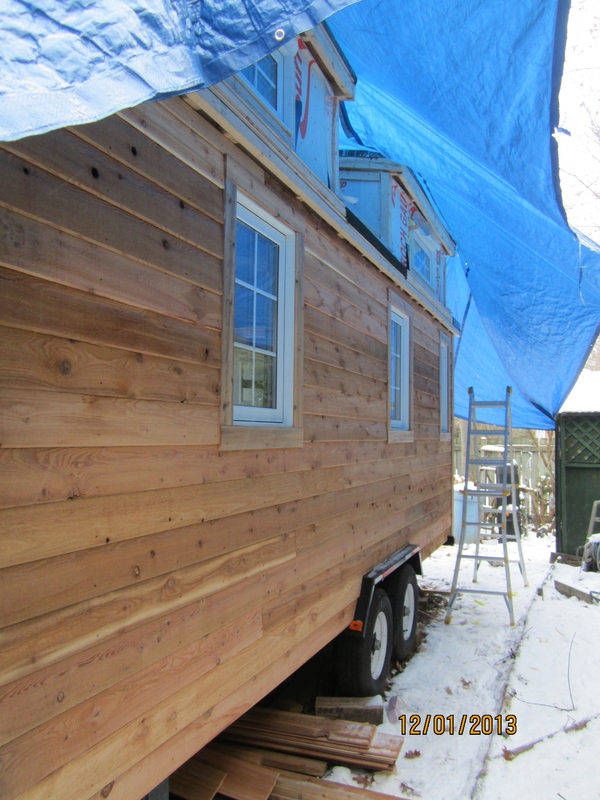 After completing the siding, I took a bit of a building hiatus for the holidays. 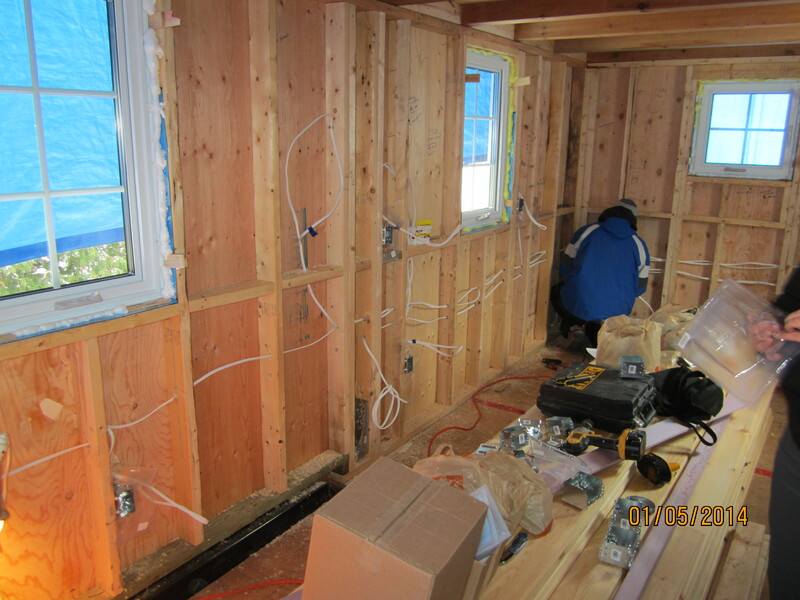 Today we started roughing in the electrical. It’s an easy enough sentence to write, it was far more challenging to get ready to rough in the electrical. 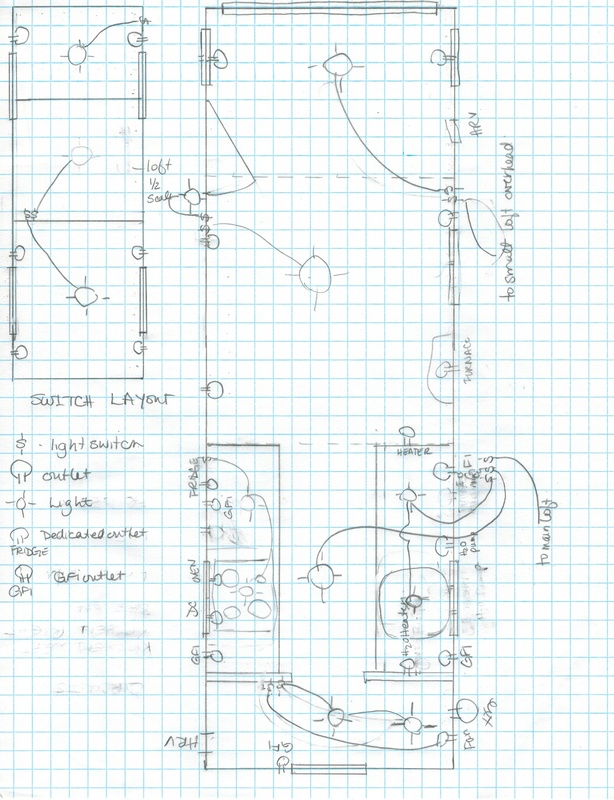 Because I have changed the interior layout of my tiny house from the plans I bought, I had to plan out my electrical. In September, I started talking to an electrician who offered to help me design my electrical system, unfortunately, he had to back out in early November. 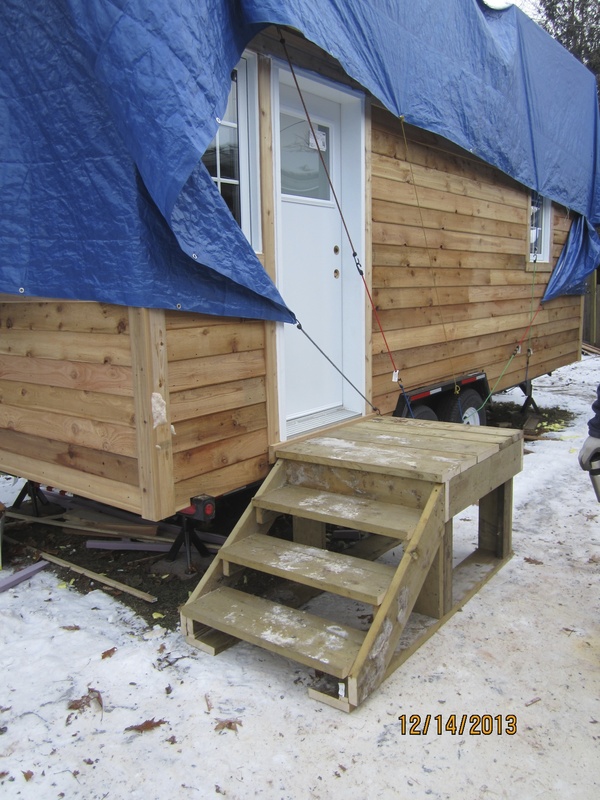 Designing the electrical system fell to the wayside and it wasn’t until the siding was completed that the electrical had to be tackled. Problem was, I didn’t know how to tackle it. A friend, who is a retired engineer and came to the rescue. 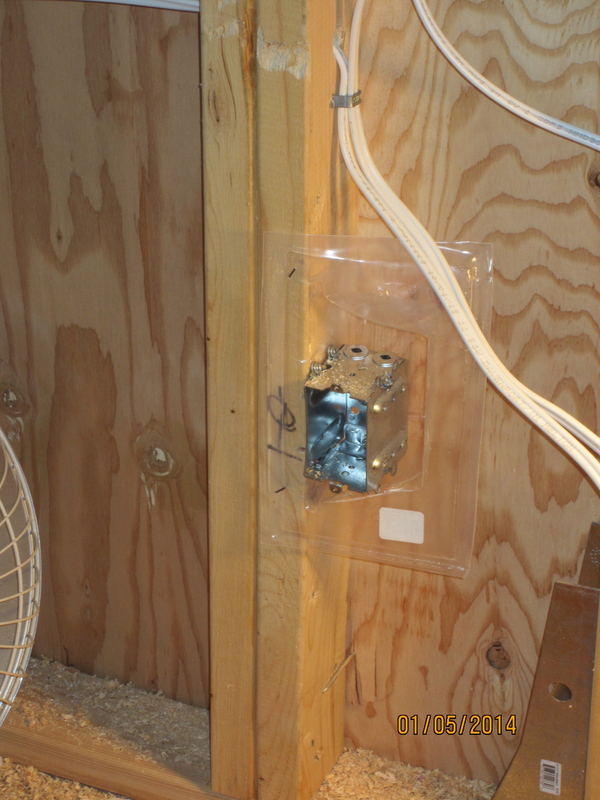 With his help, I was able to hash out a layout for my electrical system,I sent it to an electrician to double-check it, yesterday I went shopping for the AC components in the system, and today, we started roughing it in. It was great to get back to the build. 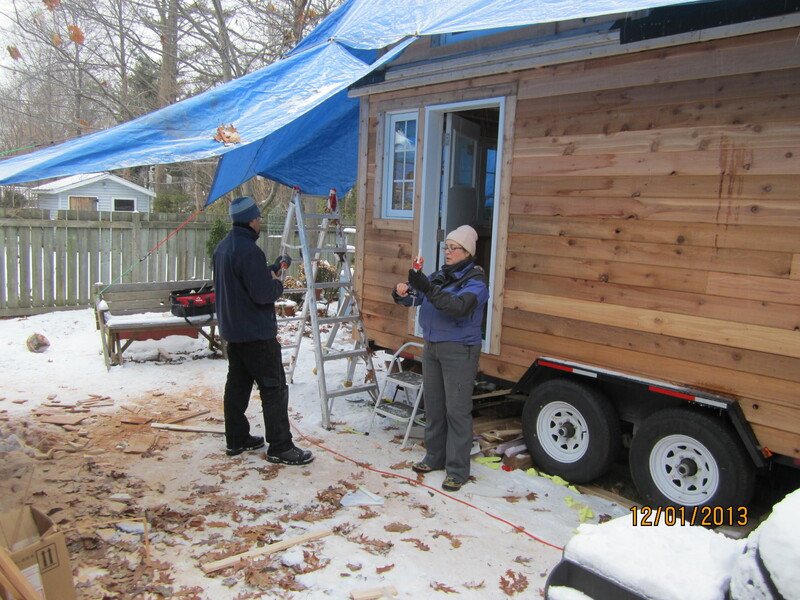 It took 2 space heaters to get the tiny house warm enough to work without gloves on. We started by marking out the locations of all the outlets and boxes. We stapled vapour barriers in place, installed the boxes and then holes were drilled for the wires to run through. The wire was run one circuit at a time, leaving enough slack for the wire to be put into each box later on. I colour coded each circuit so that when the electrical panel is put in later (the panel will be on an interior wall that won’t be built until after the insulation is done), it’s easy to know which circuit is which. We got most of the circuits put in today. Next week, we finish the putting in the last of the circuits and install all of the bathroom fan vent, the furnace vent, the HRV units (or as soon as they arrive), the water and electrical in. 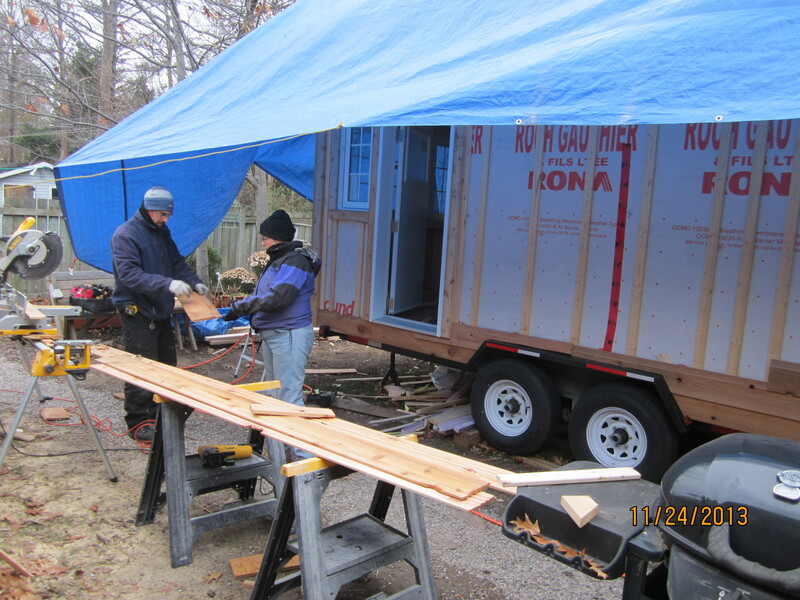 Once that is done, we prepare for the spray foam to be installed, sealing up any openings to the exterior, building up the boxes around the wheel wells, and protecting the electrical outlets from the foam. I am getting a plumber to install the propane lines before the spray foam gets in. 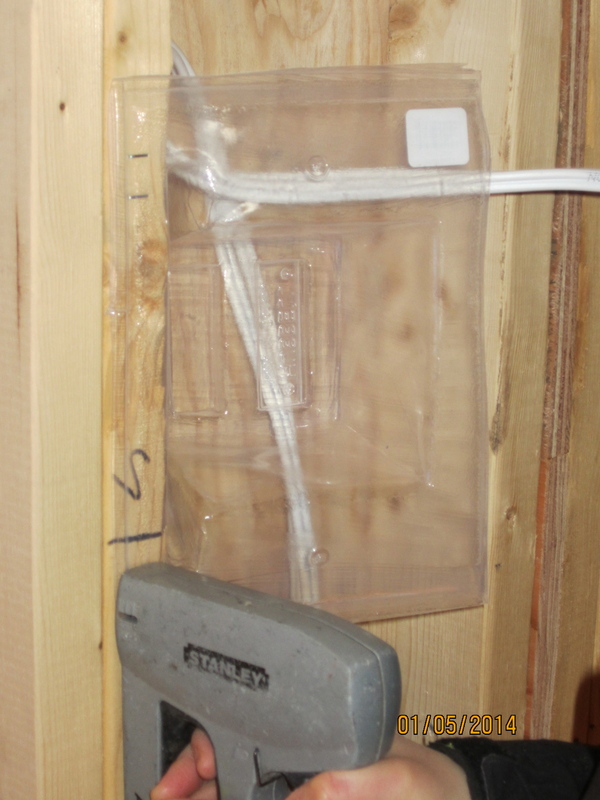 My first attempt at putting in an electrical box. My Stairs! They are made from the lumber removed from the trailer. 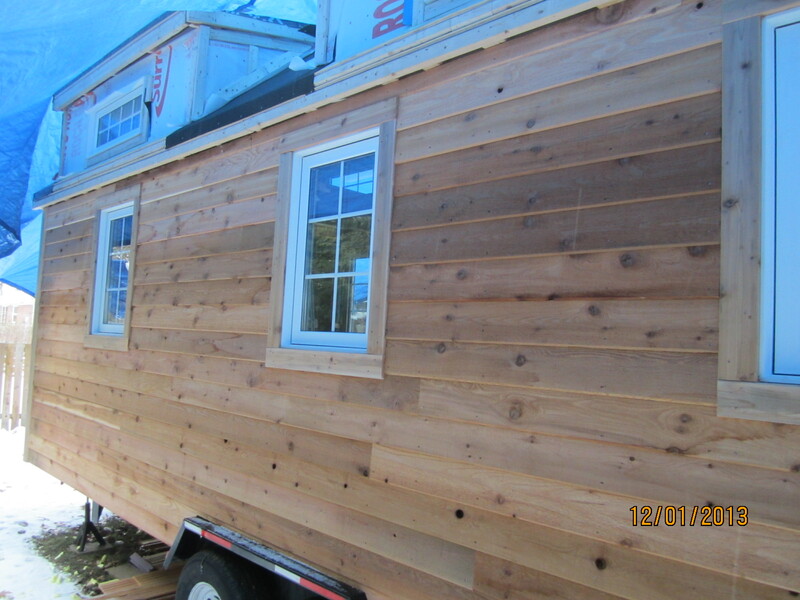 The exterior siding on my tiny house is done! This weekend we finished up the siding on the dormers and it is really satisfying to see the house with all of its siding completed. 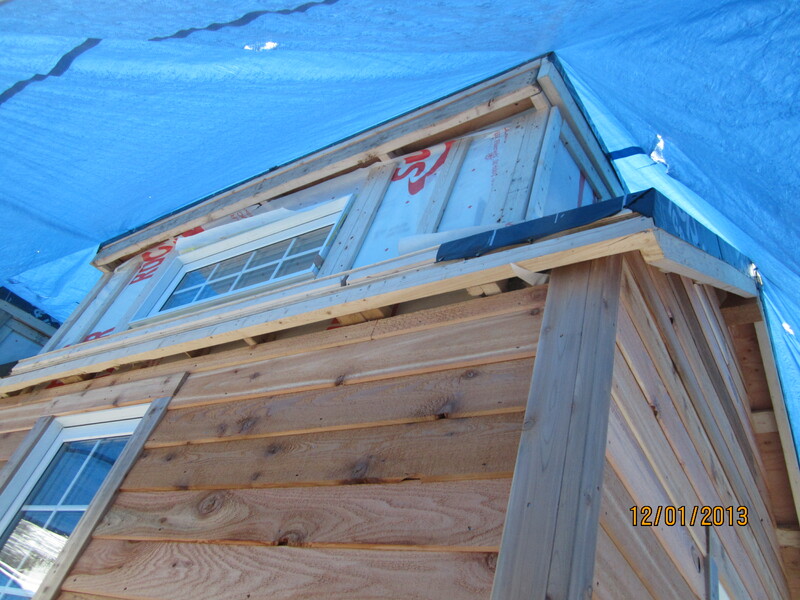 Unfortunately, the roof wasn’t able to be done this past week because the 4″ screws weren’t delivered. So, fingers crossed, the roof will get done this week. 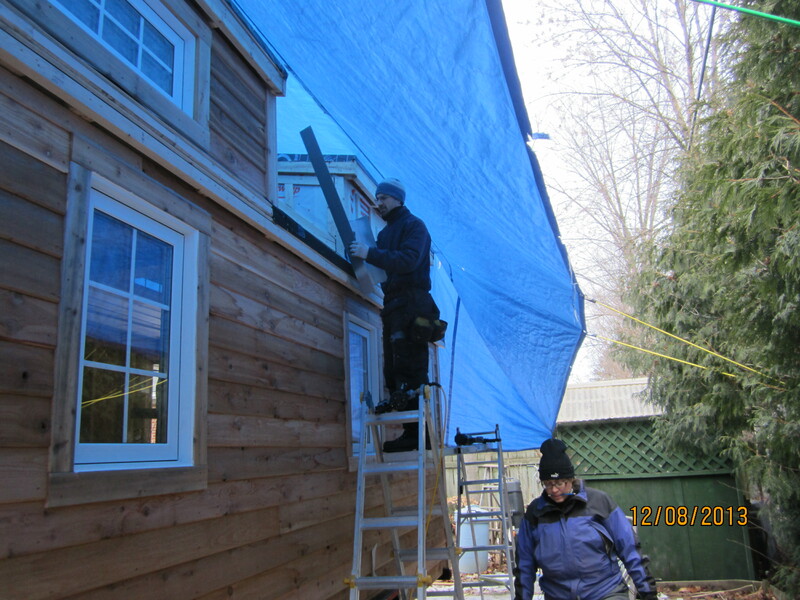 In order to put up the siding on the dormers, the flashing had to go up along the front and two sides of the dormer where they meet the roof line. Aluminum flashing 4×4 L flashing was cut to size and nailed into place with the roofing nailer and then strips of weather guard was installed on the side of the flashing that was on the roof. All of this to keep water out. 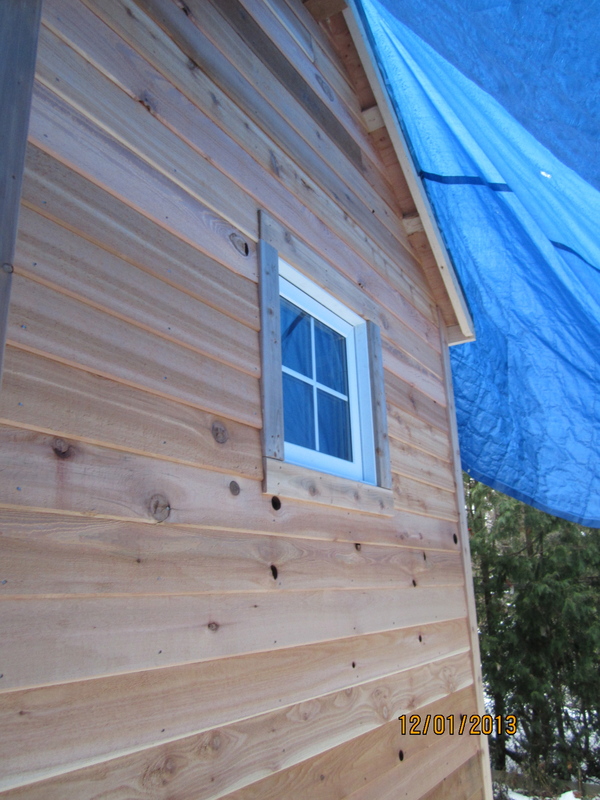 After the flashing was installed, the trim was put up and then the siding. The angled sides of the dormers ended up going more quickly than expected. Getting the angles for the slope of the roof took a bit of time, but once that was done, it was a matter of getting one piece cut and checking that the angles were right (there angles were not the same for each dormer – some of that due to the insulation, the flashing, etc) and then cutting it to size and then using that piece as a template for the piece above it. I was rocking the mitre saw, changing the angle of the saw and making some simple notches. I then would run the cut pieces to Stefan, who was up on the scaffolding or a ladder and he would check the fit, get me to adjust the size and then install them. 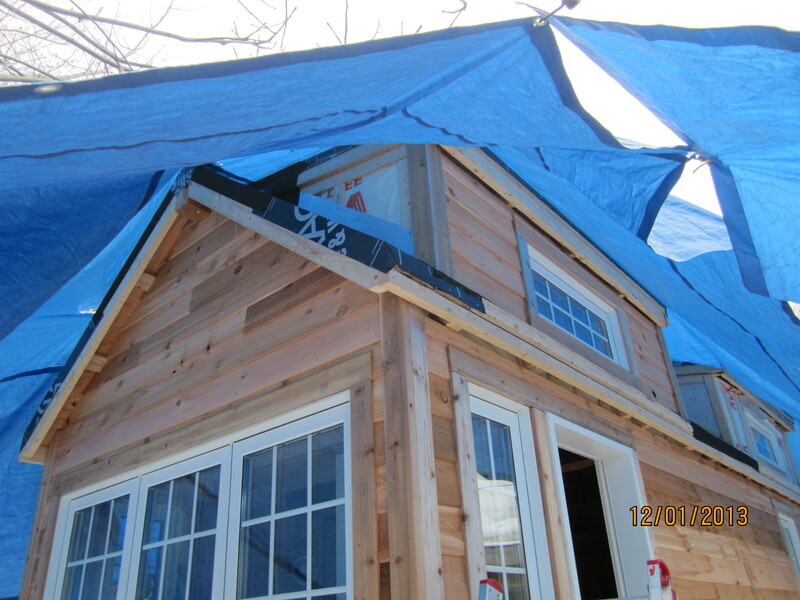 The last couple of pieces on each side of the dormers were the trickiest, requiring lots of different angles. There wasn’t much waste and I should have enough siding left over to build a small utility shed on the tongue side of the house. 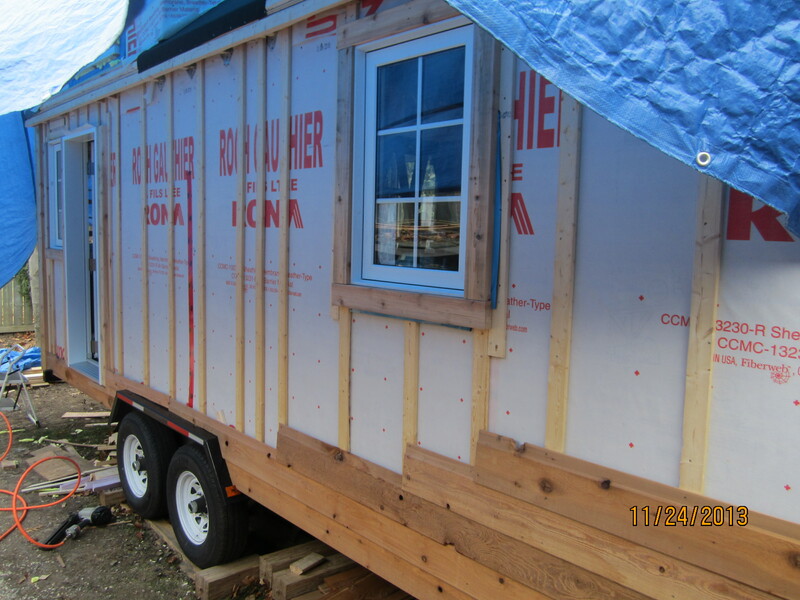 Once all the siding was up, we moved the interior siding that was delivered back in October into the tiny house. I started to move it early this week with the help of my aunt and two of my cousins. It became clear that my original plan for getting the interior siding into the tiny house was not going to work out. So we left the job half done and Stefan and I finished it this weekend. Stacking 16′ long boards inside a 20’10” house takes patience and delicacy. Next step, a roof (everyone send good thoughts out for a delivery of 4″ metal roofing screws on Tuesday), then getting the electrical and gas lines roughed in, so that the spray foam insulation can go in. Once that is done, the interior can begin. A dormer with all of the siding up. The sides of the house are covered in siding! My original order of interior and exterior siding was not enough. So, on Friday, JTM Scierie, a local sawmill, from whom I ordered my ridge beam and siding, delivered the rest of the exterior siding and trim that I needed. 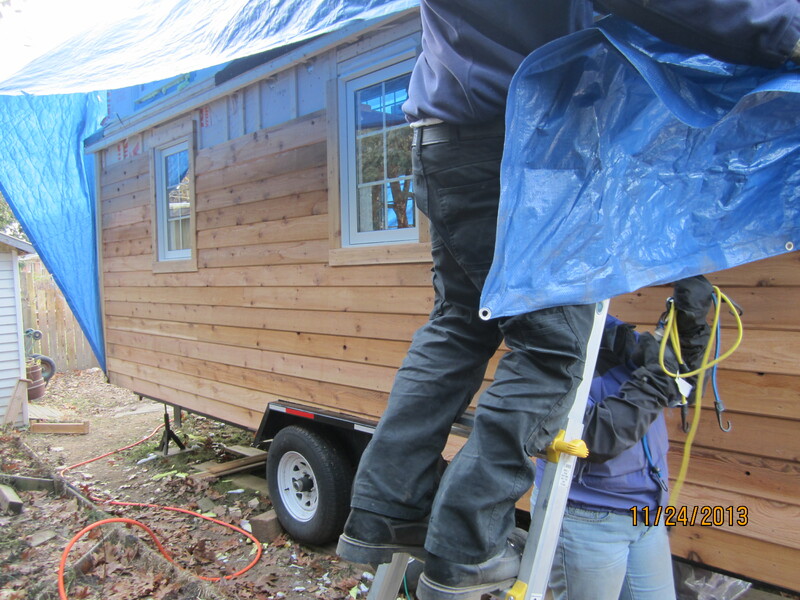 We finished putting up the trim on the rest of the house excluding the dormers and then we got to work on the siding. 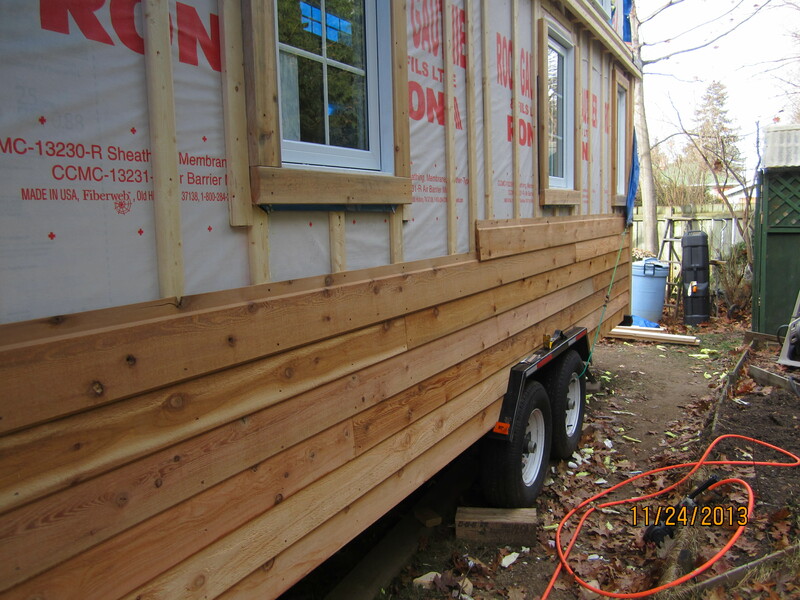 Finishing up the siding on the main sections of the four exterior walls was pretty straightforward, the whole process slowed down as soon as we hit the angled sections on the two short walls. I have discovered that my brain is not comfortable with some of the pattern making required in construction. Figuring out how to adjust angles and how to trace out sections that have to be cut out makes my brain hurt. Fortunately, Stefan was kind enough to get down off the ladder when need be to figure out a new angle on the saw or cutout, getting down off the ladder helped him stay warm. My neighbour was also kind enough to lend me his table saw so we had an easier time ripping down siding this weekend. I have not worked a table saw before and Stefan set about to teach me how to use it, but it turns out that learning how to use a table saw in subfreezing temperatures while wearing gloves is not strongly advised. Which is a drag because it slowed us down a little, but I got to keep all my fingers, so all in all, I’m glad I am waiting to learn how to use a table saw. The dormers didn’t have any strapping on them when we started putting up the siding, so all of the strapping for the dormers had to be cut and installed. Unfortunately, we ran out of the 1×3 we were using for strapping. The roof is supposed to be installed this coming week and getting the strapping up will help the roofers. So we put up as much as we could. Fortunately, I cut almost all of the strapping for the angled sides of the dormers, so we won’t have to worry about remembering to many of the angles needed for that strapping. 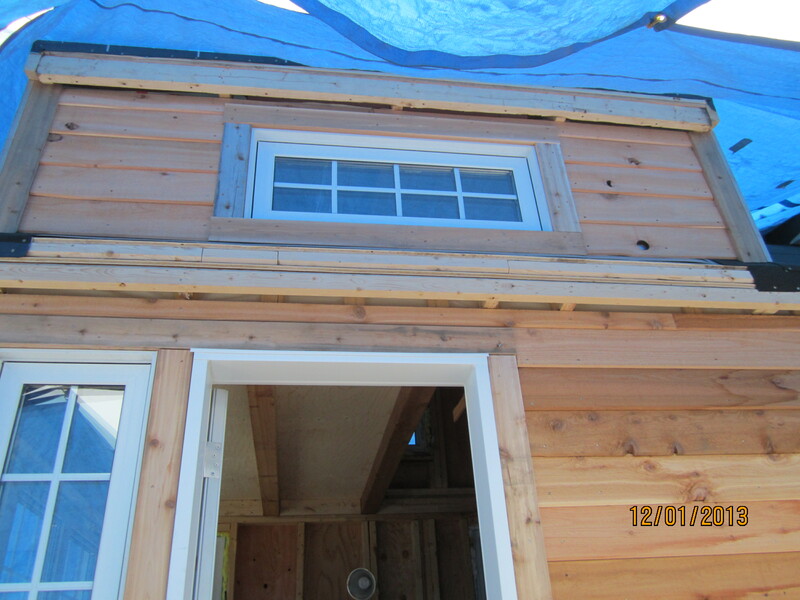 We did get to put up the trim and siding on the face of one of the dormers. What a difference it makes to have siding up. It’s really starting to look like a house. It will look so much better once the blue tarp is down. That poor tarp has seen better days. 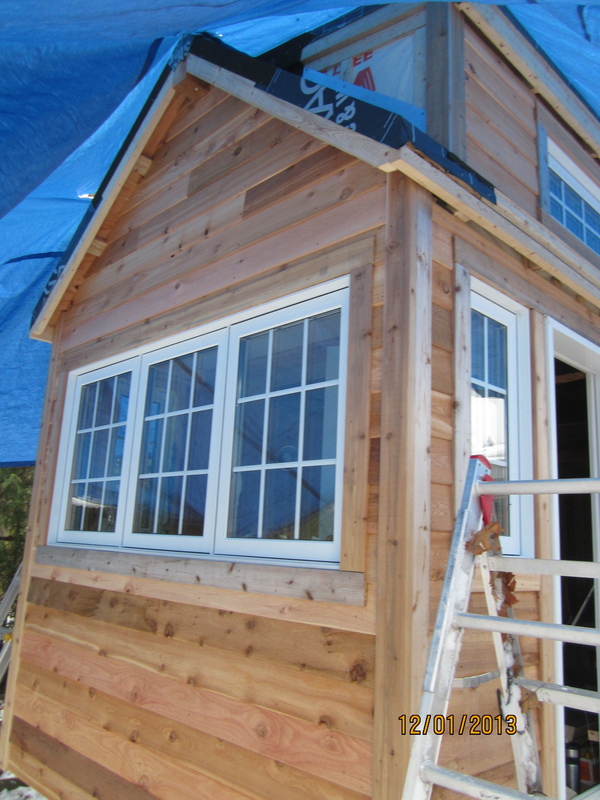 To finish up this weekends build, we caulked the windows on the main floor and the door. I am not particularly comfortable caulking. First of all, it makes me giggle every time I have to say I am going to caulk something, because I’m a little bit twisted and spend most of my life with my mind in or very close to the gutter. This weekend I discovered why I have so much trouble caulking (see I’m giggling to myself as I even write it). I have trouble caulking because my fingers are too small. If you haven’t had to seal an edge with caulk before that may sound really strange. The process involves laying a bead of caulk along the edge you wish to seal, then spraying it lightly with some soapy water (a step that Stefan taught me, which does make things a little easier) and then you take your finger and with gentle pressure, move it along the caulk so that you spread the caulk enough to create a good seal. When I attempt to swipe the sealant with my finger, I end up removing most of the sealant, apparently my thumb is my only digit big enough to tackle the job. We may not be able caulk the dormer windows until spring because it was already a bit cold to install the caulk this weekend and then it needs a few days above freezing to cure. First dormer front all trimmed up and with siding installed. The bathroom wall (tongue end of the trailer). Dormer with all of the strapping up. All of the siding up on the back wall. 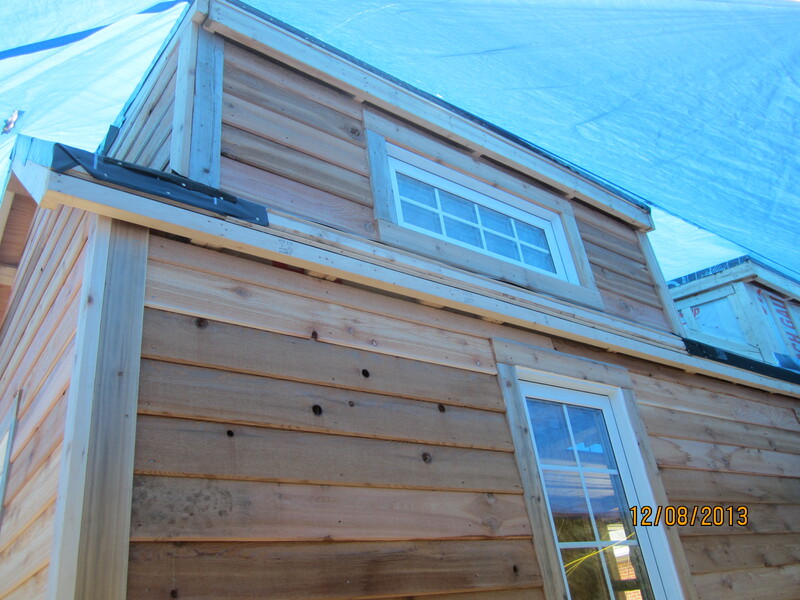 Another view of the dormer and large window siding. Another view of the back wall. The building done this weekend has been extremely satisfying! 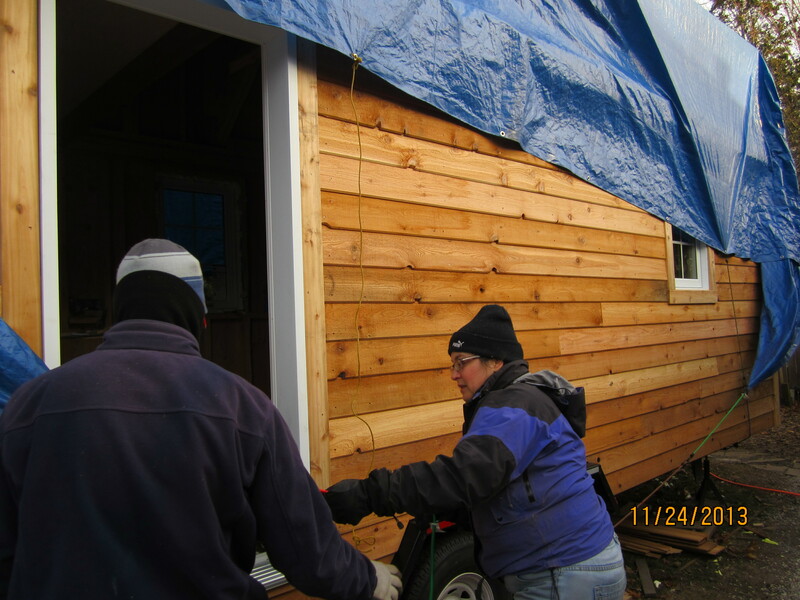 Three walls almost completely covered in cedar lap siding, in below freezing temperatures. As I write this I am under a blanket wearing two sweaters, flannel pants and a scarf. After building last night it was the same get up plus a toque. Clover is also cuddled up and snoring next to me and I appreciate the extra warmth. We also shaved off the extra foam from around the windows on the main floor. Once the bottom edge of the walls was sealed, the trim went in place. Unfortunately, I miscalculated on the amount of trim I ordered, so we were able to trim all of the main floor windows and the door with the exception of the top trim on 2 windows. Getting ready to make the cut. Then came siding. A truly satisfying step. There is a lumber yard about a 35 minute drive from my build site that a friend let me know about and I ordered my ridge beam, flooring, exterior and interior siding from them a couple of months ago, before I updated the plans I am using to build, and I didn’t order enough of a couple of things. That order was delivered last month and it is great to get it up on the walls. They helped me get a good price and part of why my price was so good is because I got B grade siding. B grade meaning that there are knots and knot holes in the siding. The knot holes will be filled with foam, and the foam will blend in when the siding is painted. Some of the bottom edges have “faults” in them and I have to say, I am really enjoying the imperfections. 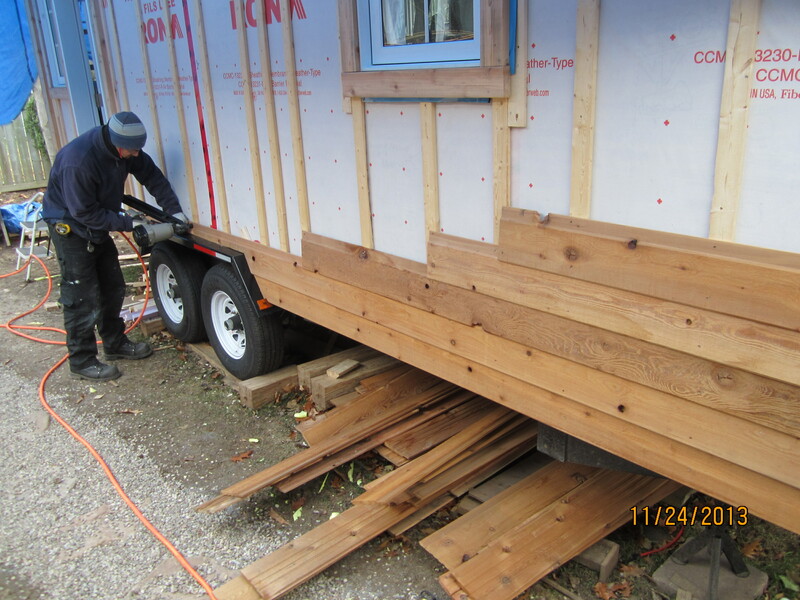 The first two rows of siding on the long walls of the house were slow, having to cut the siding to fit around the wheel wells, but after that it went pretty quickly. 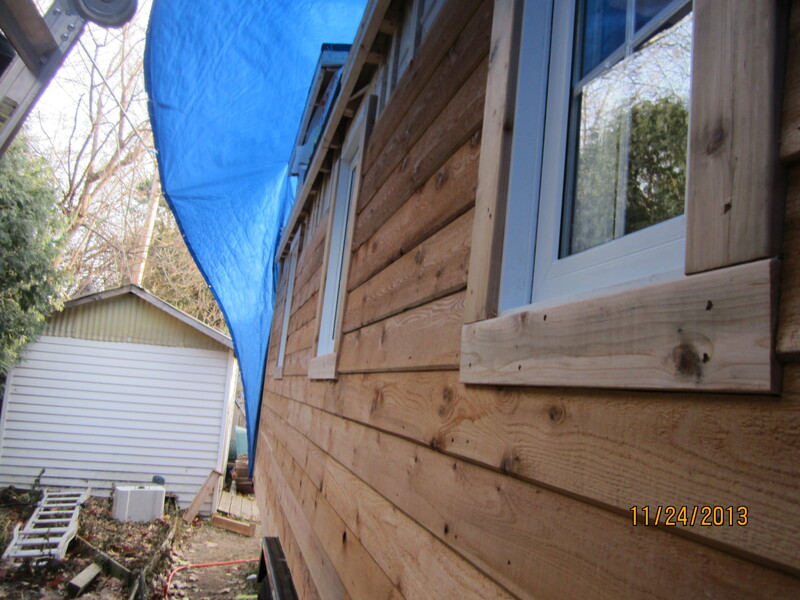 As it is lap siding and not tongue & groove, Stefan suggested that we nail the top and the bottom of the siding in so that there is less chance of siding getting loose when the house is on the road. You can see the nails along the bottom of the siding, once again, I don’t mind seeing those nails. They will also be a little less visible when the house is painted, which won’t happen until spring. I am painting the house with semi-transparent exterior paint in what is called atlantic blue. The trim will be white. The far wall with half of the siding up. Look at that siding and the windows with trim. The end of the day was spent wrestling the tarp back into place. It was really windy and cold (-8C/17F).